Waller WH. Planetary Perspectives on Terrestrial Climate Change. The Galactic Inquirer. 2017 Nov 15 [last modified: 2018 May 24]. Edition 1. In the Solar System, the poster child for excess warming by greenhouse gases is Venus. This twin of Earth in terms of size and mass orbits 30 percent closer to the Sun than the Earth does. The inverse-square law of solar irradiation vs. distance tells us that Venus must receive twice as much sunlight per square meter as does Earth. 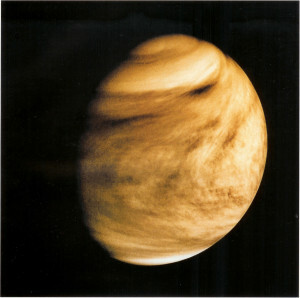 The Stefan-Boltzmann radiation law further predicts that Venus – in the absence of an atmosphere – should then have a surface temperature (in Kelvins) that is about 1.2 times greater than Earth would have without its atmosphere.1 That would amount to 306 Kelvins (+33 degrees Celsius or +91 degrees Fahrenheit). Any human in a spacesuit walking the atmosphere-free surface of Venus would find such a temperature pretty darn hot but certainly tolerable. In actuality, however, the temperature at the surface of Venus is a torrid 750 Kelvins (477 degrees Celsius or 890 degrees Fahrenheit) – a full 2.6 times greater than Earth’s current average temperature of 289 Kelvins (+16 degrees Celsius or +61 degrees Fahrenheit) and 2.9 times greater than Earth’s predicted temperature in the absence of an atmosphere (256 Kelvins).2 This extreme thermal state on the surface of Venus would be sufficiently hot to melt lead or to vaporize sulfur. The stunningly hot surface temperature of Venus can be completely understood in terms of its thick atmosphere of nearly pure carbon dioxide (see Figure 1). Like other “greenhouse gases,” CO2 is transparent to visible sunlight but opaque to the infrared re-radiation from the planet’s warmed surface. Currently, Venus is blanketed by a layer of gaseous carbon dioxide that is 92 times more substantial than the atmosphere enveloping Earth. Perhaps early in its history, the planet hosted a thinner atmosphere, a cooler surface and maybe even oceans. However, over time, whatever oceans there were warmed up enough to vaporize. Without the oceans to absorb the gaseous carbon dioxide that was vented by early volcanism – and without the geological processes and marine life that we have on Earth to further entrain the carbon into limestones – the level of atmospheric CO2 blanketing Venus kept rising unabated. The result has been a runaway greenhouse effect that makes the surface of Venus hotter than any other solid surface in the Solar System. On Earth, the atmospheric composition is dominated by molecules of diatomic nitrogen (78%) and oxygen (21%). The remaining 1% consists of various “trace” molecules – including the key greenhouse players of carbon dioxide, methane, and water vapor. These gases have warmed Earth’s surface by 13 percent – from the predicted average of 256 Kelvins (-18 degrees Celsius or -0.40 degrees Fahrenheit) in the absence of an atmosphere to 289 Kelvins (+16 degrees Celsius or +61 degrees Fahrenheit) in the presence of Earth’s current atmosphere. This natural greenhouse warming is responsible for Earth having hosted liquid oceans throughout much of its history (see Figure 2). Since the industrial revolution began in the 1800s, humans have burned enough carbonaceous “fossil” fuels to nearly double the amount of atmospheric carbon dioxide. We are now seeing the effects of this pollution in the form of higher average temperatures (by about 0.6 degrees Celsius or 1.1 degrees Fahrenheit since 1950), rising sea levels, melting glaciers, and more intense storms. 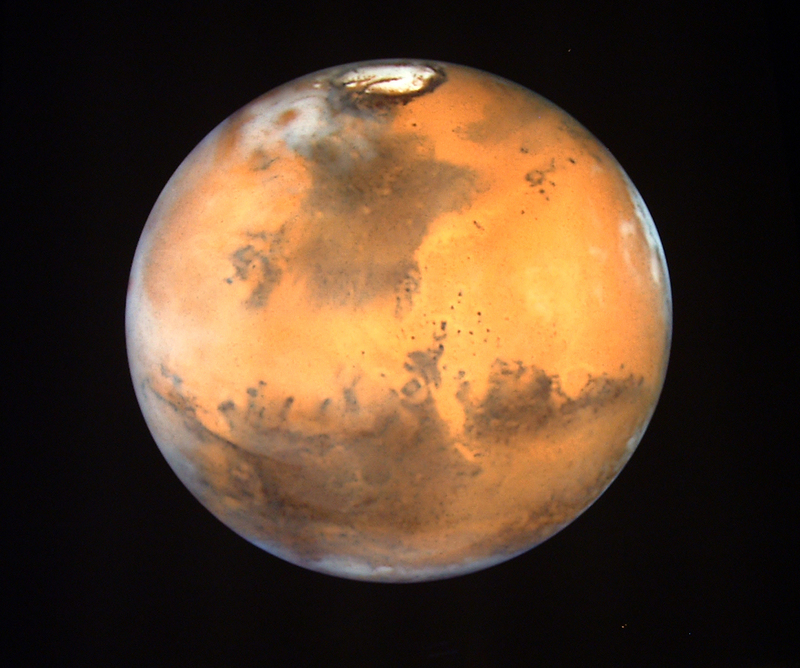 Mars is roughly half the size of Earth and Venus and about a tenth their masses. The planet’s lower gravity and lack of a protective magnetosphere has made it difficult for Mars to retain much of an atmosphere. What there remains consists mostly of carbon dioxide. Because the atmosphere of Mars is 100 times less substantial than that on Earth (ie. the atmospheric pressure at the surface is down by a factor of 100), whatever greenhouse warming it can muster is insignificant. Perhaps early in its history, Mars had a more robust atmosphere that briefly allowed for liquid water to flow over its surface. Recent robotic missions to Mars have accumulated an impressive dossier of images and chemical assays that favor a volcanically active and wet young Mars – all indications of a substantial atmosphere having been in place. Once the planet’s liquid metal core cooled and solidified, however, the dynamo generating its protective magnetosphere shut down, and the solar wind scraped away most of its tenuously-bound gases. Today, we are witness to a mostly cold, dry, and airless place (see Figure 3). There are other planetary atmospheres to explore, including the thick nitrogenous atmosphere that blankets the frigid Saturnian moon Titan and the atmospheres associated with exoplanets beyond the Solar System that are just now being detected and crudely assayed. Meanwhile, the above comparison of the atmospheres enveloping Venus, Earth, and Mars demonstrates the worth of understanding our own atmosphere, climate and its changes within the context of other planetary atmospheres. We should pay heed to the important role that greenhouse gases play in modifying planetary climates – and should commit to policies that remediate what we have done to our home planet’s atmosphere over the last 200 years. William H. Waller, Ph.D. is a former NASA astrophysicist and professor of astronomy. He currently teaches physical sciences in his hometown high school, writes popular books on astronomy, and co-edits The Galactic Inquirer – a free online journal on all manner of astronomical topics (see http://galacticinquirer.net” title=”http://galacticinquirer.net. He can be reached at williamhwaller@gmail.com. To relate the irradiation of a material surface to the surface’s corresponding temperature, the temperature must be expressed in units of Kelvins, where 0 K refers to “absolute zero” thermal energy (e.g. see Chapters 13 & 14 in https://openstax.org/details/books/college-physics). These predictions of average planetary surface temperatures in the absence of an atmosphere take into account the planetary surface’s reflectivity (bond albedo) as well as the variation of solar irradiation with longitude and latitude on the planet (geometric albedo). 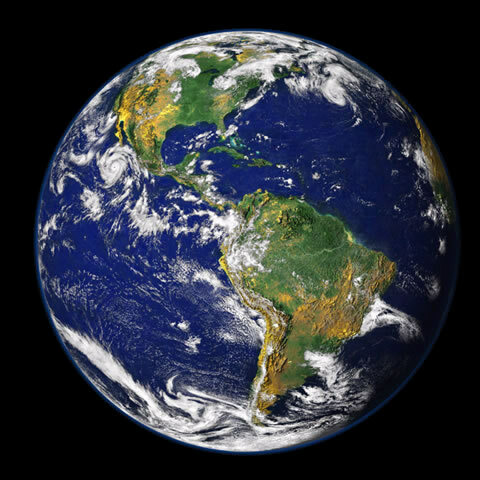 They also assume that the planet’s surface is thermally conductive, so that the thermal energy on the day and night sides is averaged out (see https://nssdc.gsfc.nasa.gov/planetary/factsheet/venusfact.html). In actuality, the absence of an atmosphere would cause the planet’s day and night sides to have very different surface temperatures – as is evident on the surfaces of Mercury and the Moon. Correction: The amount of atmospheric carbon dioxide (CO2) has increased by 44% since pre-industrial times rather than the doubling (100% increase) mentioned in the text. This increase should still be regarded as alarming. As an environmental science major, I found this article offered further insights on a topic that dominates today’s news. Climate change is a problem that affects everyone and everything on this planet. The human-generated accumulation of carbon dioxide and other greenhouse gases in our atmosphere is the main contributor to the change in our climate. We as humans have known that our planet has been warming, yet there has been little done to try and mitigate this disturbing trend. This article points to other planets in the solar system, and how understanding what happened there could help us here. It is thought that Venus used to bear a similar make up to that of Earth. Venus may have had a thinner atmosphere, cooler temperatures, and even oceans. However now, Venus has an atmosphere that is thick with carbon dioxide. Because of this thick atmosphere, little to no infrared radiation is able to escape the surface of Venus. This causes Venus to have the hottest solid surface in the Solar System. With pollution increasing steadily since 1950, the average temperature of our planet has been increasing, too. If this pollution trend continues, how much more can our planet take? Does Earth hold the same fate as Venus? Even if Earth’s climate doesn’t get as extreme as Venus’s climate, how much more warming can we as humans withstand?